Anyway, the material came from a thrift shop and my sister found it when she was over visiting recently. It’s a nice medium weight corduroy and I knew immediately I wanted to make some winter dungarees for my wee boy Joseph with it. 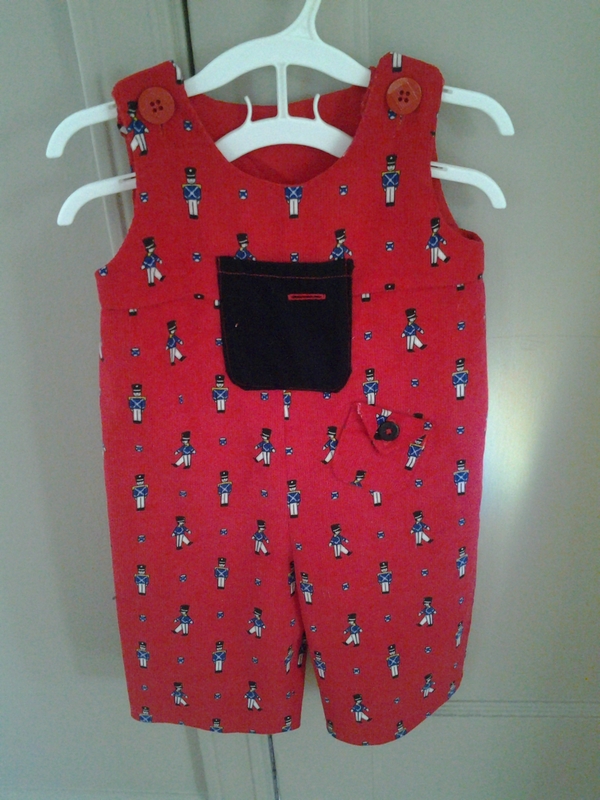 The pattern I used was for more of a summer pair from the book, Cute Clothes for Kids. The pattern comes in sizes 3, 6 and 9 months in the baby section of the book. I used the 9 months pattern for my 7 month old and they are just a touch too big for him. I think he’ll be able to wear them at around 8 months or so, but he is a big wee lad and is already wearing some 12-month clothes, so I think the sizing is pretty spot on. In terms of changes, I wouldn’t dare make any pattern changes at this stage of my sewing (that would be rather idiotic) but since I used a thick, very bright red corduroy, I decided to use quite a dark, possibly unbaby-like black flannel as a contrast for the majority of the pockets and martingale. I was a little concerned it would be too adult, but with the red topstitching, it tied together fine I think. Probably not the best topstitching in the world, but I was pleased. The instructions are simple, with nice accompanying illustrations. However, I would say they are aimed at the advanced beginner/intermediate sewer. Not that the construction is so complicated, but it definitely assumed knowledge I didn’t have. If you have a little experience though, I’m fairly sure you would skip through without too much of an issue. The problems I had were mostly because I just didn’t know how to do things and it took me a couple of attempts to figure things out. The first major mistake I made was cutting the legs out upside down. I didn’t realise this for a while, but with baby’s dungarees, the long part of the leg, which would be the LEG on an adult’s trouser leg, is actually the crotch part for the baby, presumably because they have big nappies and tiny wee fat legs. Sigh. Thank the hairy Gods above that I had enough fabric left. Well, almost enough. I was short about an inch or so on one back leg. I tried to spread it a little between the waist and the bottom of the leg, but just hoped I would be able to adjust (without really having any idea what I was doing). Oh well hey? Okay, so what else did I learn? Well, at first I wasn’t going to put a lining in since the corduroy was thick anyway. It took me sooooo long to figure out how the heck the instructions worked without a lining – and then I figured out that they didn’t, which was why I couldn’t figure it out. 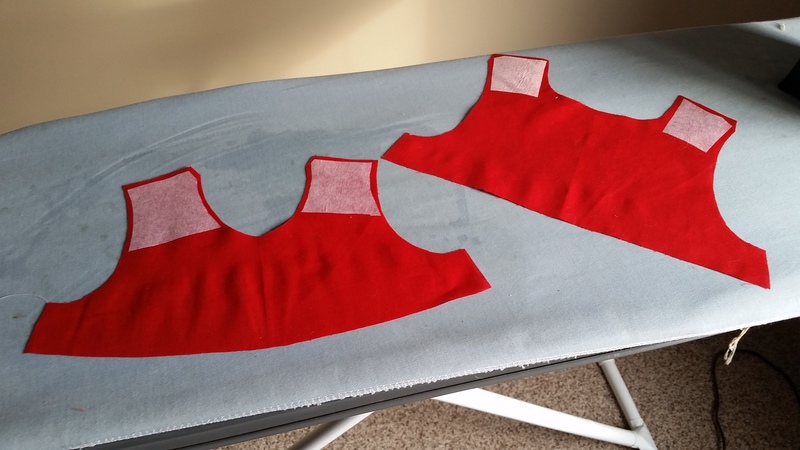 Luckily I had some matching red cotton in my stash, so I decided to line the bodice and reasoned that it would be another learning bonus for my stock of no-sewing-experience-whatsoever. Oh yes – and I also interfaced the lining, as suggested. And then stitched the lining on the wrong way. Gah! 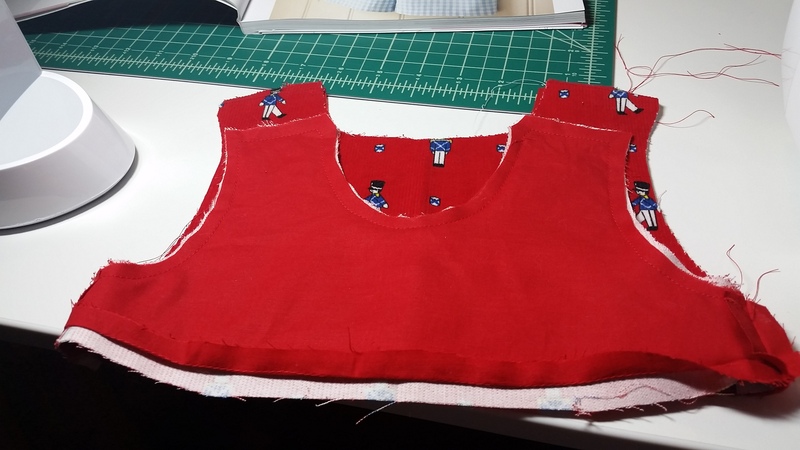 It worked in the end, but I had to rip out the interfacing. Luckily the straps didn’t seem to need it too much. I also spent much head-scratching time on the sewing the crotch together part. Okay, I’ve never done any of this before and it’s definitely not obvious, but I was so confused. Then I realised I had misinterpreted the instructions and had sewn each back leg to the wrong corresponding front part. Once I realised that, it didn’t take too long to sort. Well, just an hour or two. The final big thing I learnt in a trial and error kind of way was how to attach the top to the bottom. I puzzled over this for HOURS. I knew how it should end up… and I knew it had to involve the right sides being together… but that DIDN’T work!! 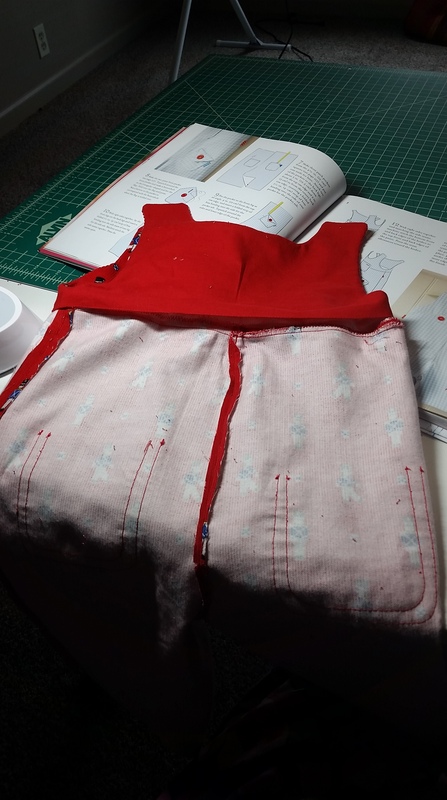 Again, it suddenly clicked that the diagram I was trying to follow was showing the dungarees AFTER the top and bottom had been stitched and the top pulled right way round. I had to stitch the top in upside down. Aha!! Okay, so I know I could have looked that up on any YouTube video (and I definitely did for the crotch problem), but it was late and I just ruminated over it in bed.